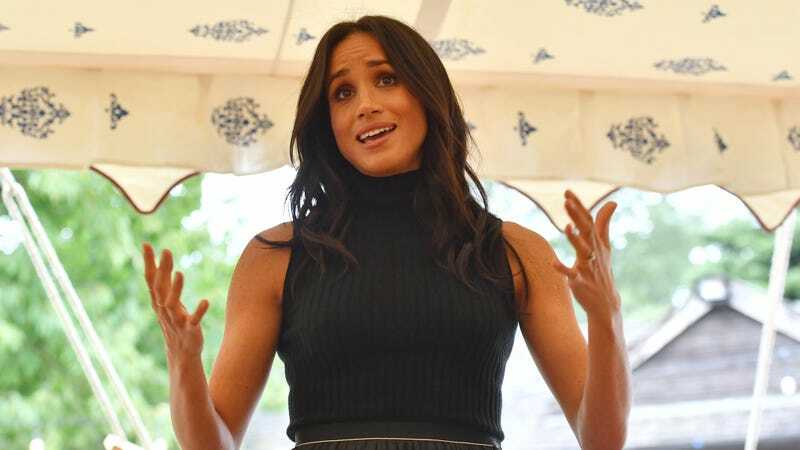 Meghan, Duchess of Sussex speaks to guests during an event to mark the launch of a cookbook with recipes from a group of women affected by the Grenfell Tower fire at Kensington Palace on Sept. 20, 2018 in London, England. You know, there’s a word for folks who don’t take “no” for an answer, choosing instead to obsessively fixate on someone, even showing up uninvited at their residence. According to the Daily Mail and the Mirror, Samantha Markle, the perpetually-messy, estranged half-sister of Meghan, Duchess of Sussex, once again proved that the new royal was right to distance herself when she showed up at the gates of Kensington Palace over the weekend, reportedly planning to “confront” her famous sister about the treatment of their father, the equally questionable Thomas Markle. Armed with a purportedly handwritten note (contents unknown), the 53-year-old Markle, who suffers from multiple sclerosis but nevertheless flew all the way to the United Kingdom to make a scene, was photographed attempting to leave said note with the palace guard, after arriving unannounced. Access was denied, as reportedly was the attempted communication, but that didn’t stop the messiest Markle from achieving her desired photo ops. She and her unidentified companion (presumably boyfriend Mark Phillips) were then spotted buying royal-themed merchandise—including Meghan and Harry masks. We dare not even speculate on why. This, of course, follows nearly a year of seeming harassment and media appearances by Samantha Markle (including a rumored stint on Celebrity Big Brother UK) since her celebrity sister announced her engagement to Prince Harry in fall of 2017—including rallying their father into making a media spectacle of himself, as well. After threatening to crash the royal wedding in May, and then claiming to have allegedly been involved in a paparazzi-induced car crash that she compared to Princess Diana’s, though police have said there is no evidence of such a crash, it seems safe to say Samantha Markle’s idea of family is dysfunctional, to say the least. With this latest stunt, it seems Markle has escalated from half-sister to full stalker. As usual, the Duchess of Sussex has issued neither comment nor acknowledgment of this latest spectacle.